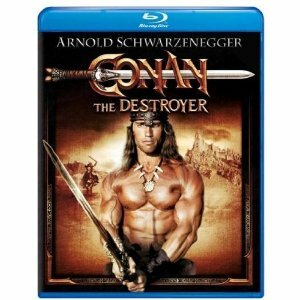 In honor of the theatrical release of the remake of Arnold Schwarzenegger’s early 1980s adventure franchise, the original Conan the Barbarian films have been released on high definition Blu-ray. Both films look spectacular in high definition, even if it seems outdated compared to the 300 looking remake, which is glossy and in 3D. Still, there is no need for all of that fuss when you have a good film, and the fact that Conan the Barbarian and Conan the Destroyer are still entertaining nearly thirty years later is a testament to the films. Conan the Destroyer is one of the few sequels to jump from an R-rated film to a PG-rated one. And this was after the creation of PG-13, which came in 1982, while this sequel was released in 1984. It pushes the edges of PG, with plenty of sexual innuendo and violence galore. It just lacks the bloodiness of the first film, and instead amps up the camp elements. Schwarzenegger is barely even a fully fledged protagonist. He may as well just be a prop for much of the film, his muscles displayed for action scenes. As soon as the action ends he becomes much more comical, like a supporting player rather than the hero. And every attempt to give him a romantic storyline is denied as well, making this a curious film that seems to be pointing towards a third that never came. This time around Conan is tricked into a mission by the evil Queen Taramis (Sarah Douglas), who takes a backseat in the action for much of the film. Conan is given the task of escorting a virgin princess (Olivia d’Abo) and her bodyguard (Wilt Chamberlain) to the magic Horn of Dagoth, with the help of his faithful companions. The Blu-ray is remastered and looks spectacular, but the disc is lacking any special features beyond a theatrical trailer.